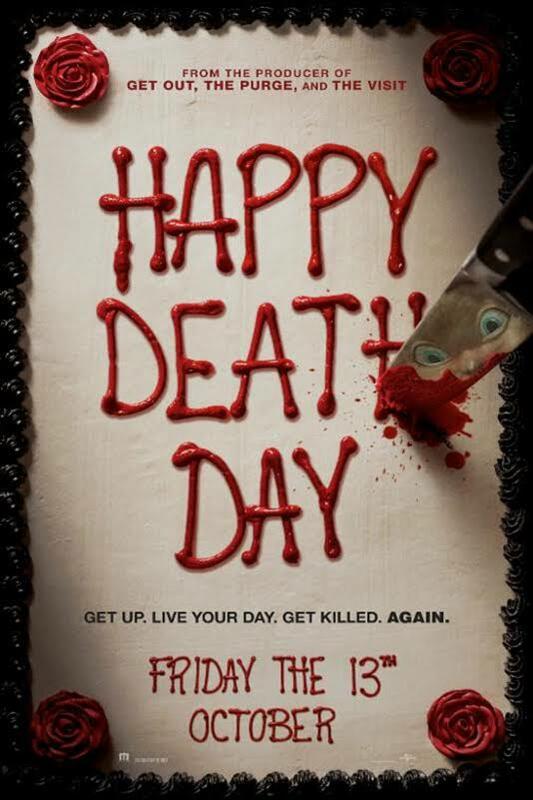 Happy Death Day is like Groundhog Day on acid and much more fun than I expected it to be. Jessica Rothe is a pleasure to watch as she attempts to unravel the truth about who is trying to kill her. It's not who you think and although it's a horror movie, it's not all that scary. In it's first two weeks out the film has a worldwide gross of more than 56-million dollars. Not in the mega-movie arena, but it's certainly a success considering the modest budget under 5-Million. If you haven't seen this one yet, it's certainly worth a look. During the month of October 2017, Brian James Freeman and the folks at Hydra, have gotten together to present a total of twenty-five Halloween tales of horror from twenty-five of the best genre writers working today. Every Tuesday during October there will be a new volume in the Halloween Carnival anthology series. Volume Four is my least favorite so far this series but it's still worth your time this Halloween reading season. The Mannequin Challenge by Kealan Patrick Burke - A Twilight Zone kind of story about an office Halloween party and a rather bizarre mannequin challenge. There were sixteen people in all, every one of them in costume, every one of them playing statues." All except Theo, late to the party, no costume, and his reaction is perfect. Across the Tracks by Ray Garton - Sometimes you have to cross the tracks to find a better neighborhood for trick-or-treating. "That was another benefit of crossing the tracks on Halloween. There were frequent parties underway in the houses they visited, and a lot of hot moms wore slutty costumes. It was a great opportunity for eleven and twelve-year-old boys to catch a glimpse of some thighs and cleavage that were not on a screen." What Kenny, Sam, and JayJay stumble upon at one such house was certainly an eye-opener. The Halloween Tree by Bev Vincent - My favorite story in this collection. Trick or treating with friends and a scary old tree. "On Halloween night they'd have to walk beneath it and that was freaking Luke out." Pumpkin Eater by C. A. Suleman - An interesting story about how couples grow apart over the years. When the Leaves Fall by Paul Melniczek - This collection's novella is about a terror which slowly consumes a town and they way one young man deals with it as a kid and then as an adult. There is some lovely prose in this story. "Leaves had begun their slow patient glide to death weeks ago and now September was just a recent memory, as October wrapped the landscape in its dusky arms and stole its life, peeling apart the summer flowers and snatching up the burnt orange and yellow leaves, pulling them to the ground where they dried into husks and shriveled away." I may have been a bit disappointed in this set of Halloween tales, but I'm still looking forward to Volume Five to close out the series. 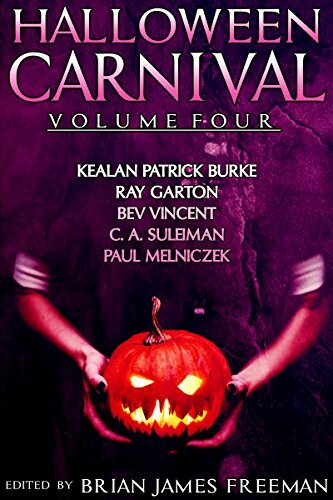 Halloween Carnival Volume Four is published by Hydra, a division of Random House, and is available as an ebook. 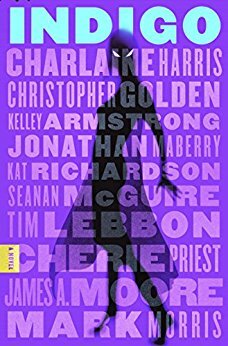 Indigo features the talents of great genre writers like Charlaine Harris, Christopher Golden, Kelley Armstrong, Jonathan Maberry, Kat Richardson, Seanan McGuire, Tim Lebbon, Cherie Priest, James Moore, and Mark Morris. However, with these many strong writers, each bringing their own voice to the story, there were times when, as a reader, it seemed the tale would be going in one direction and suddenly, would change dramatically as a new writer took the reins. There was also a lot of repetition and I would have liked a little less exposition and more story. Indigo is conceptually strong with the lead character, Nora, using shadows to move from location to another and having the power to use those same shadows as weapons. I loved the early action as she all but obliterated the local chapter of The Children of Phonos, a worldwide black magic cult. and I thought 'Finally a superhero who gets the job done." But then things took a turn and we got dragged down into a morass of self-doubt and self-discovery that caused the story to drag on for a long time. The negatives aside, there is real depth to be found in Indigo. It was certainly a revelation when Nora finds out everything she believed about herself to be a lie. I'm glad I read Indigo, but I can't readily recommend this one. Of course, your experience may vary and with this many talented writers there really is something for everyone. Indigo is published by St. Martin's Press and is available in hardcover, e-book and audio formats. Some people just see the world differently. Matt Bechtel is one of those people. - James A. Moore. After reading this collection I'd have to agree with that assessment. Matt has an eye for detail and is masterful at shedding a unique light on the otherwise mundane. This sixteen story collection begins with the title tale Monochromes the story of individuals who see the world in different colors, or in this singular case, in black and white or better yet, in shades of grey. A man in a tweed jacket walked out of the men’s room shaking his hands dry; clearly, they were out of paper towels. Half way across the restaurant, he succumbed and dried them on his pants. The waitress counted down her cash drawer in preparation of shift break, muttering numbers to herself as she tapped away at an old adding machine with a roll of printing paper. Two teenage girls gossiped over root beer floats at the counter, giggling madly as they sucked ice cream through straws into their braces-filled mouths. You know, it's only a matter of time until this is the reality for every company you call. 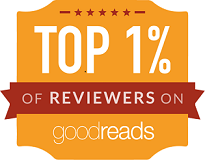 ...three bestselling authors charged by us, knocking me back and into Anna, who was perched on the top rail. One was female. All three were naked. Of course the names have been changed to protect the guilty. Then there's the brilliantly disgusting The Beginning of the End and the wonderfully imaginative Before Parachutes. “Someday,” he promised the boy, “when I shuffle off this earth, I’m leaving you the ol’ bag o’ bolts.” Then he kissed the plane’s propeller. He always kissed his plane after he insulted it in public, like most men do their wives. Another of my favorites is Last Man Standing. To the best of my knowledge competitive standing is not a thing. Only from the mind of Matt Bechtel. There's a good deal of heart to be found in Tears of a Clown and the charming A Man Walks Into a Bar. As I read this collection, I found Matt to the a master of the "What if?"story. In this instance, "What if" every joke about walking into a bar all showed up in the same establishment. Why didn't I think of that. I'm going to drink concoctions that not even a mad scientist would whip up at his home bar. I'll mix whiskey with milk and toothpaste, vodka and Goldschläger with grape Shasta, luke-warm, day-old coffee with a shot of Everclear. I’ll rate them by how foul they taste when I puke them back up. The one that makes me vomit through my eye sockets wins. Take the truism that a body will completely replace all cells every seven years, add a man with an obsessive-compulsive disorder into the mix and follow to its logical conclusion and you'll have A New Man. And then there's the final tale or should that be tail? Cozzy's Question about an alley cat faced with the most important question. By far, my favorite tale is this “Twilight Zone”-esque story which actually made me tear up for a moment. Monochromes and Other Stories is a richly diverse debut collection from an author to watch. My highest recommendation. 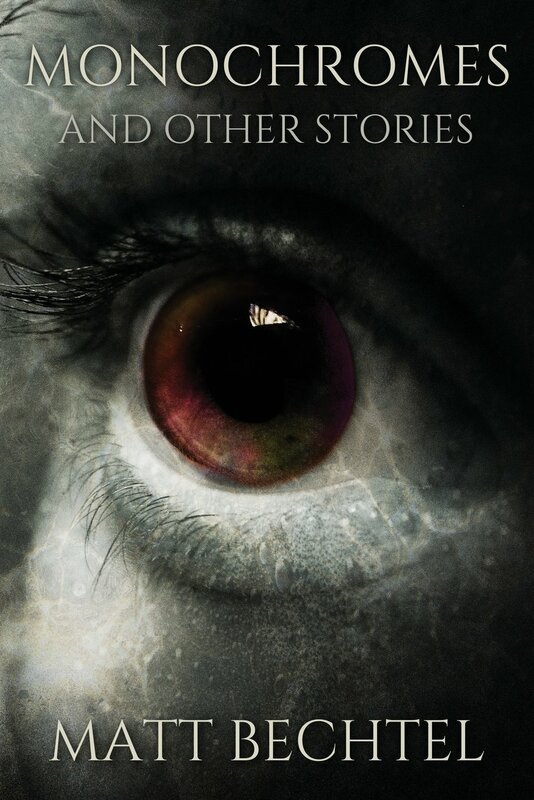 Monochromes and Other Stories is available in both paperback and e-book formats from Haverhill House Publishing Company. If you subscribe to Kindle Unlimited you can read it at no additional charge. Also, if you are an Amazon Prime member you can read it for FREE using the Kindle Owners Lending Library. From the author's bio - Matt Bechtel was born just south of Detroit, Michigan (cursing him as a Lions fan), into a mostly-Irish family of dreamers and writers as opposed to the pharmaceutical or construction giants that share his surname. As such, he has spent most of his years making questionable life decisions and enjoying the results. Mentored by their late founder Bob Booth, he serves on both the Executive Committee of the Northeastern Writers’ Convention (a.k.a. Camp Necon) and as a partner in the Necon E-Books digital publishing company. His writing tends towards dark humor/satire and has been compared to Ray Bradbury and Cormac McCarthy. Matt currently lives in Providence, Rhode Island. Volume three is a solid entry in this series and is well worth your time this Halloween reading season. The Way Lost by Kelley Armstrong - A delightfully disturbing story with a killer opening line. "Every Halloween, one child in Franklin lost his way and never came home." The truth makes this tale even more chilling. Calavera by Kate Maruyama - A Calavera is a representation of a human skull used in the Mexican celebration of Dia de los Muertos (Day of the Dead). Trish makes one of these skulls to honor her friend Jasmine, but not everyone is happy about her decision. The Devil's Due by Michael McBride - A wonderfully horrifying story of an annual sacrifice a town has been making ever since its inception and how one man defies the ritual and the consequences that follow. Great storytelling. A Thousand Rooms of Darkness by Taylor Grant - A terrifically imaginative and original story of a woman who suffers from phasmophobia (a fear of ghosts) and samhainophobia (a fear of Halloween). The truth is even more frightening. My favorite story in this collection. The Last Night of October by Greg Chapman - Greg is an Australian artist and Horror writer, who grew up in a world without Halloween. It's true, in Australia, Halloween just never caught on. No trick-or-treating, no costumes, no Halloween. But, Greg's a horror writer and since Halloween is nearly synonymous with Horror, he's done his homework and the result is this gem of a novella about events that took place and continue to take place on The Last Night of October. Recommended and looking forward to Volume Four in the series. Halloween Carnival Volume Three is published by Hydra, a division of Random House, and is available as an ebook. Volume one was a top-notch set of four shorts and a novella and while the second book is not quite as strong. It's still worth your time this Halloween reading season. Halloween Carnival Volume Two begins and ends with novella length stories with three shorts in between. The fun starts with..
Mr. Dark's Carnival by Glen Hirshberg - This novella's been published before, including an ultra-limited hardcover edition from Earthling Publications, which became the first of many Halloween limited edition books. Is it possible that Mr. Dark's Carnival—the inspiration for all our Halloween festivities, the most celebrated attraction or event in the history of Clarkston, Montana—never really existed. if you've never read Mr. Dark's Carnival, you're in for a treat. The best story in this volume. The Facts In the Case of My Sister by Lee Thomas - The horrors of spousal abuse told in this story of a brother's unwavering love for his sister. Mischief Night by Holly Newstein - In Pennsylvania, the night before Halloween is known as Mischief Night. Kids play harmless but annoying pranks, like throwing toilet paper into trees, soaping windows, and egging cars. Occasionally lines are crossed, and what was annoying becomes malicious. Sometimes even deadly...like what happens when a group of boys decide to prank Mr. Worrall, the assistant principal. The Ghost Maker by Del James - What happens when a mob hit-man goes to a Halloween party. The Pumpkin Boy by Al Sarrantonio - Al Sarrantonio is one of my favorite Halloween storytellers. I love his stories set in his fictional Orangefield which is where he takes us for this novella of child abduction and the Pumpkin Boy. The Pumpkin Boy had a bright orange pumpkin head with cold night steam puffing out of the eyes, nose and mouth cutouts, and a body consisting of a bright metal barrel chest and jointed legs and arms that looked like stainless steel rails. Recommended and already looking forward to Volume Three. 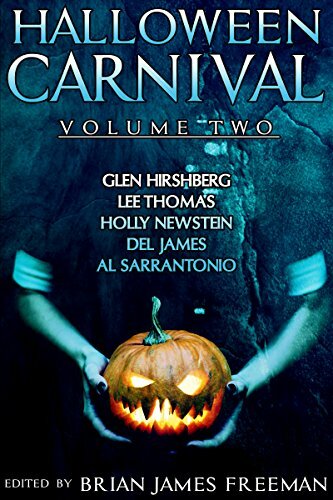 Halloween Carnival Volume Two is published by Hydra, a division of Random House, and is available as an ebook. Over the course of October 2017, Brian James Freeman and the folks at Hydra have gotten together to present a total of twenty-five Halloween tales of horror from twenty-five of the best genre writers working today. Every Tuesday during October there will be a new volume in the Halloween Carnival anthology series. If the rest of the series is as strong as volume one, readers are in for a treat. Strange Candy by Robert McCammon - Wow. What a wonderful way to open this anthology. A strange piece of candy from the Halloween "loot," eaten without thought, leads to a series of out of body experiences. Not dissimilar to Dickens' ghosts in A Christmas Carol. A charming story from start to finish. ...I didn't want to die, but...still...it was just a piece of candy, shaped like a hand. What was the big deal? The Rage of Achilles or When Mockingbirds Sing by Kevin Lucia - One of Kevin's Clifton Heights stories. This one takes place on Halloween and features the customary twist. Horrifying. Tragic. Real. Gut-wrenching. Demon Air by John R. Little - Mom never admitted it, but Halle always knew she was named after Halloween. Halle finds herself on a plane to Australia in search of her roots after learning she was adopted and taking one of those DNA Ancestry tests and finding out she was 60% Australian Aborigine. All of that takes a backseat when the Diamond Air flight she's on crosses the International Dateline. It's Halloween and suddenly she's in the middle of a nightmare where the flight crew is trying to get her to bob for apples... He brought the green bowl toward her, and she could see the water sloshing. When she looked down, she saw that the water was tan-colored and had patches of fuzz floating on it. The apples were rotten. Not just a little. They were mostly brown patches with worms squirming in and out. There were so many worms that she couldn't see any spot on any of the apples that was clear. La Hacienda de los Muertos by Lisa Morton - The filming of a Mexican horror movie at the site of a real-life haunting. LaLlorona was once an earthly woman who fell in love with a man and had two children with him. The man betrayed her. So she killed the two children by drowning them, then herself in the Tecpan river...now her spirit supposedly wanders the banks of the river, looking for living human children she can claim as her own. Every story delivers in his own way. I hope subsequent volumes in the series are just as creepy. If you love a good Halloween scare half as much as I do, start reading today. 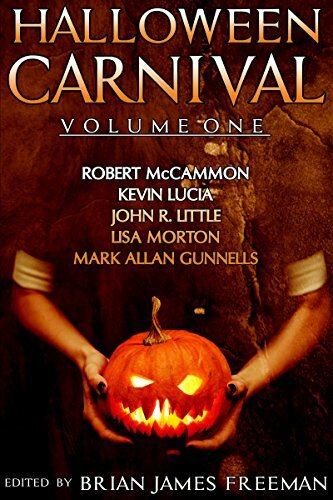 Halloween Carnival Volume One is published by Hydra, a division of Random House, and is available as an ebook. Thomas Carnacki is a fictional occult detective created by English fantasy writer William Hope Hodgson. Carnacki was the protagonist of a series of six short stories published between 1910 and 1912. These stories were printed together as Carnacki, the Ghost-Finder in 1913. Somewhere along the way, William Meikle picked up the torch and continued the tradition begun by Hodgson more than a century ago. Carnacki - The Edinburgh Townhouse is Meikle's third such collection. The basic formula for these stories hasn't changed in over a hundred years, yet the stories are fresh as anything being written today. Fins In the Fog - The story of a shark with revenge on its mind. Featuring Captain Gault, a pirate, of sorts, who is being chased by a shark, even on land. The Cheyne Walk Infestation - One of Carnacki's dinner parties is attacked by creepy crawly thingies. An Unexpected Delivery - Thomas Carnacki is questioned by Scotland Yard in the death of his old friend George Edwards as a cursed locket comes into his possession. A Sticky Wicket - I love the title of this tale of a problem at a local cricket club where the home team seems to be at a mysterious disadvantage. Mr. Churchill's Surprise - One of my favorite tales in this collection. One of Carnacki's infrequent encounters with Winston Churchill. What you are about to see is the best kept secret in the country at the moment, and we must ensure it remains that way. Apart from my chaps on guard here, there's only ten people know of it, and you are the tenth. The Edinburgh Townhouse - A delightful tale of a haunted townhouse with a touch of romance. A Night In the Storeroom - What lurks in the storeroom beneath the British Museum Library? "There was another grunt, louder than ever, and a shuffle, followed by a high screech as crates were roughly shoved aside as if they were empty." Into the Light - Winston Churchill once again calls upon the services of Thomas Carnacki. In this tale we learn that summoning a demon is one thing and controlling it is quite another. I greatly enjoyed the storytelling which often takes place after a nice meal with friends and retiring to the library for drinks and smokes. The style is not dissimilar to that of Sir Arthur Conan Doyle's Sherlock Holmes stories, even though the tales themselves are decidedly different. Now I'm going to have to go back and read Meikle's previous Carnacki collections, Carnacki Heaven and Hell and Carnacki: The Watcher At the Gate. 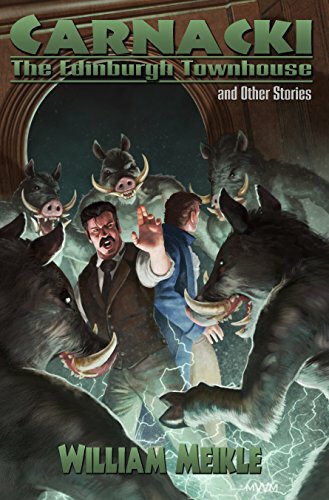 Carnacki: The Edinburgh Townhouse and Other Stories in both paperback and ebook formats. From the author's bio - William Meike is a Scottish writer, now living in Canada, with twenty novels published in the genre press and over 300 short story credits in thirteen countries. He lives in Newfoundland with whales, bald eagles, and icebergs for company and when he's not writing he drinks beer, plays guitar and dreams of fortune and glory.